In the real world, we are used to seeing light sources not only at night but during the day as well â€“ even in the daytime we recognize a car has its headlights on for example. Although we can not see the light from such a light source, since daily light from the sun over-lights it, during dawn and dusk we can. E.g. the light from headlights is seen in the morning about an hour after the first rays of the sun. Lit light sources (like car headlights) are evident even throughout a sunny day. The night was very dark in Arma, which many players appreciated. It was caused by almost zero value of ambient light. However, to avoid overexposing the image at night by artificial light sources (street lamps, car headlights, fireplaces, etc. ), the Light Value (LV) of these resources and the intensity of the emissive materials were very low. Therefore, when the sun came up, they immediately ceased to be visible. Twilight in Arma could not have looked like in reality for these reasons. The sun as light source has a very high light value and it can not be measured by standard means (estimated at 25-30 LV). Meanwhile, its light on a clear day at noon is then 16-18 LV. Car headlights are 19 LV and therefore brighter than sunlight. When lit, they should be seen in the daytime. Their light at a distance of 1 meter has a value of 11 LV, and because it is weaker than sunlight, it wouldn't be apparent at noon. To approach the situation in the real world, we have increased the intensity of the ambient light at night. The night, however, is still dark, because at the same time we've increased the aperture. The human eye in the real world cannot adapt below a certain threshold and therefore sees darkness with some remnants of light. 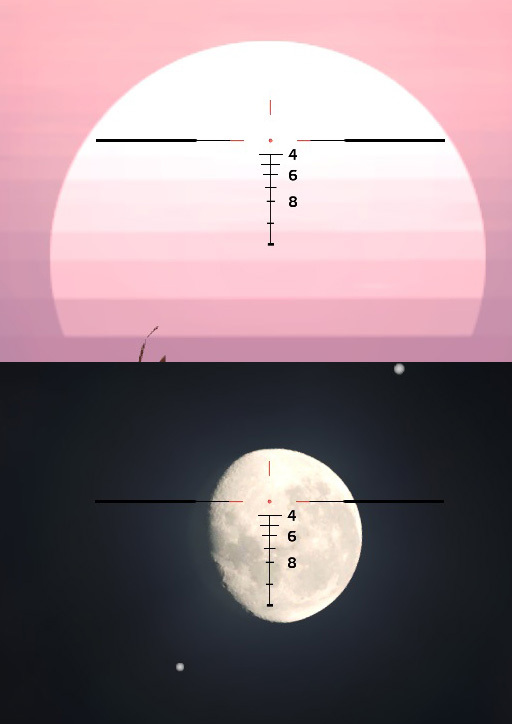 If we now were to play as a cat in Arma, we would reduce the aperture at night and the night would look brighter. This change has allowed us to set higher values of lights so that they are seen at dawn and dusk, and the light sources themselves even during the day. The brightness of the lights got closer to their real originals. Thanks for the update! However none of the dynamic lights work on my GeForce GTX 460 (bug #7372) so can't really test the night lighting. But I really like the changes to daytime lighting. So, these changes will fix the "ugliness" due lack of lighting in bad weather\dusk\dawn conditions, rendering strange behaviour with artificial lights in general and other things like muzzle flashes? I love the progress made with lighting, but the sun texture needs to be resized. thats not the sun texture, look the edges can be seen beyond the sun, left and right. is it possible to make streetlights and vehiclelights available at daytime now? e.g. to enhance the immersion during heavy fog..
and will fog affect drop shadow? i am trying to create a decent dynamic sandstorm config that propperly applies to daytime, overcast and fog density and one of the problems is that there seems to be allmost no transition of the hardness of the dropshadow between clear sky and overcast. btw i got this thread with questions about lighting and stuff, in case anyone has an idea. Thanks for the update and information, it puts my mind at ease a bit. Love the work with the new sunset on the horizon, looks much better. Just looking forward to night time looking right again. Hopefully that comes sooner than later. Good luck devs. Around the time ArmA3 was announced, there were discussions about some lighting "evolutions" that BI-Devs said they probably wont make it into the final game, but maybe later with patches or engine updates. I have forgotten what it was, or how it is called, but i think it was awesome and casting light only where it should be like in RL. So no more lights that are for instance inside a completely shut building could be seen from outside, etc. It also had something to do with shadows, etc etc. Can you enlighten me guys? I hope their plans didn't change. Just had a quick test and can't comment on the overall environment lighting just yet and this may be old news for the devs but I noticed that the only lightsources that worked as "normal" lightsources for me at night was the campfire and the ifrit headlights. All other lamps like the harbour and street lamps in Agia and the headlights on the Hunter and Offroad jeep is barely noticable and totally useless (just like I remember they where when I played last time a couple of weeks ago). If I turn on NVG's I see that streetlights etc. are lit but they are very dim and do not light up the avatar/ground/houses/etc. However driving the ifrit at night was a pleasure and it's headlights lit up the road and surroundings very well. All lamp lightsources should work like this (with different lighting values of course)! C2D E6850 @ 3.40 GHz Â· 6 GB RAM @ 1066 MHz Â· GA-EX38-DQ6 Â· GTX 260 [301.42 WHQL] Â· Windows 7 Ultimate SP1 64-bit running A3 Alpha Version 0.55.104462. I really hope they haven't changed their minds on this one but I'm starting to doubt it given the massive impact in performance I'm seeing on regular builds at night. Dynamic lighting is currently taking a huge chunk out of my performance which with deferred lighting I should not be experiencing. Safe to say Arma 3 is not using deferred lighting yet. I have to agree here with DaRkL3AD3R. I hope BIS is aware of the FPS hit while playing at night time. I doubt BI are going to implement deferred shading at this point. Switching from forward shading to deferred shading requires an entirely new rendering pipeline, and AFAIK shaders also become much more complex, so all assets would need to be modified to work with it. you dont know how happy you make me with such updates!! just at the same time when i am trying to work something out with the exact same functions you are improving (fog / lighting...)!!! why the lighting at night, has been turned off completly? Flashlight can be barely seen. Street lamps, projectors do not cast any lighting at all. Only car lights, do work well. I thought, the lighting has been improved, but not removed? The lighting change requires an overhaul of all light assets, which are being worked on. The first to enter is the AH and MH-9's, with a MUCH brighter lamp though the area may be a bit too wide when you get to around 200m in the air since it spreads and diffuses rather than remaining tighter on a more closed area. If you fly up to 300m you can light up a pretty big chunk of the island. Note how as the helicopter rises (the real one) the lamp remains in a relatively small but focused area whereas A3 at the moment spreads waaay out. Also when low enough to the ground and in flight the light will make nearby vegetation to sort of blink (this only occurs around 10m ceiling. I love new mh-9 lights !!! Yep seeing the same thing here as well. Bushes and trees look all messed up. Seeing it a bit higher too though, like up to 15-20m altitude. This. But I guess its still WIP. For example flashlight, street lamps and Hunter headlights are barely visible. Strongly agree with this statement. This would look great with collission lights. However, I noticed the instruments didn't light up at all in the cockpit - just me? Just did a little testy in the editor and using the IFRIT now is amazing at night! The lighting there is fantastic and needs to be rolled out to all lights in the game (depending on performance hit). For people mentioning that the Hunter, Offroad, StreetLights, FlashLight are now unusable though in their current state that seems to be because BIS has rolled out the new environmental lighting system (which looks great) but only the new dynamic lights to certain vehicles - i.e. the Ifrit and the MH-9. So comparatively now the abovementioned light sources are useless. Its very cool to load up a map and see the different ambient lighting based on the cloud cover which seems to be very realistic imho. Try to setup an Ifrit with it's headlights on at night with full overcast, and then press escape and enable the camera mode. Fly up high and look at how far out the headlights go. That's... not quite right. And if we did this to all vehicles and lights the performance hit WOULD be huge. It needs to be something inbetween what the Ifrit currently is, and what the other vehicles are. Also, BI I see that you "fixed" the AH-9/MH-9 light on today's dev build. However the panel is still darker than it should be, so I hope it's not done. So much extra work now that these lighting changes were implemented. Don't forget the compass and wristwatch. They barely glow at all now compared to what they used to on the regular builds. Not just you. All emissive materials have to be reconfigured, anything that had a glow more or less, flash light, dash, compass, etc. Still, was nice to fly at night with nvg's and not experience this http://feedback.arma3.com/file_download.php?file_id=2295&type=bug&show_inline=1&file_show_inline_token=20130426fc6de97048670cc1110d866c807508b8ee879b0c would be awesome if it was more this http://www.fencecheck.com/forums/index.php?action=dlattach;topic=8795.0;attach=159971;image but I doubt thay is much if any priority. Oh yeah, lights on Ifrit and MH9 looks great now, putting out proper illumination of the terrain. Good job, BI.